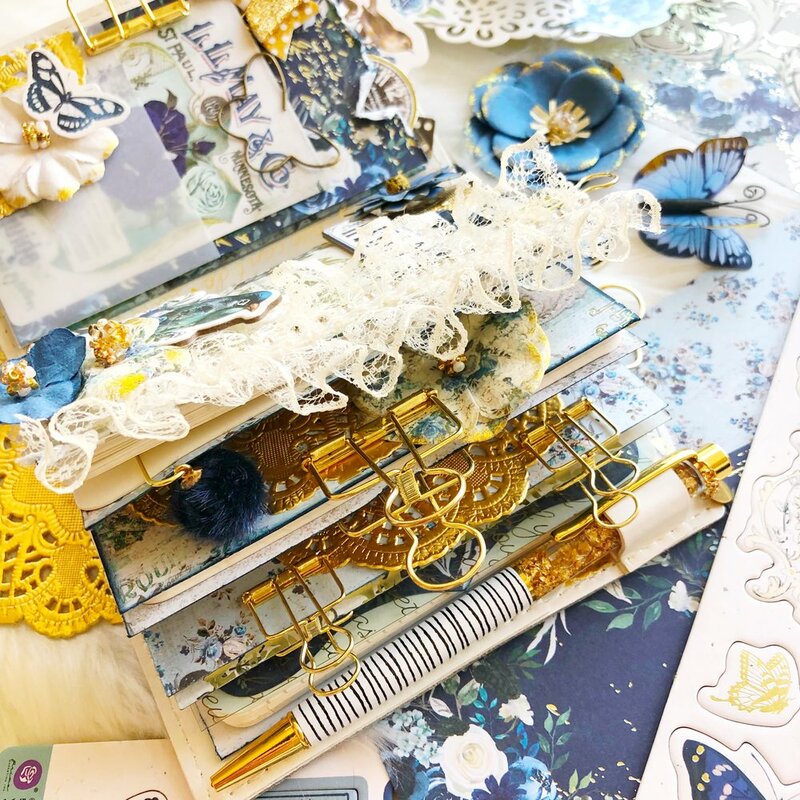 The blue and the gold in this collection are really gorgeous together, they are a perfect match and Jomelle used it beautifully in her new Georgia Blue coordinating passport travelers journal and she is here to share some of those details on todays blog. I cut up one of the 12x12 paper into the size of the TJ. I used vellum to create a pocket to hold some of small journaling cards. I added a distressed look by tearing a piece on top and inking the edge. With all the beautiful pieces that came in this collection I was able to create my cover insert in no time. I added a lace from my stash on the edge to finish the look. An easy way to decorate is to layer doily, ephemera/acetate piece and a flower. I used the farmer jeans chalk to ink the paper edges and add some more blue to my pages. Jomelle also used some of the collection elements to decorate her layout in her Standard size notebook, take a look. I fell in love with the girl acetate that I knew I wanted to make her the highlight of my layout. To see more inspirations by the talented Jomelle please follow her on Instagram @xoxo_jomelle.